So my plan WAS to pitch this as your next must-make cozy winter meal. But Mother Nature is screwing that up! This warm streak of weather has been L-O-V-E-L-Y but so unexpected. I’m still down for soup and sweater weather, but I think I may be alone. People are eating up this spring-like weather like crazy. Not that I blame them. I just wasn’t quite ready to say goodbye to cozy time. Also, side bar: I kind of think it means our world is ending. I know. I’m cray. The good (bad?) news is that I don’t think we’re quite in the clear yet. Mother Nature is a….mother. She is fickle. I fear we still have some cold days and nights in our future. Let’s just ignore the weather for a moment so I can get back to my original point: this bisque is incredible and should happen in your life ASAP. Plus, it all happens in a slow cooker or crock pot, which makes it totally appropriate for warmer weather. It will keep your kitchen nice and cool. My slow cooker takes things a step further and allows for me to saute veggies right in the slow cooker itself, rather than turning on the stove and dirtying another pan. It is LIFE CHANGING. Seriously. I have been cooking with it nonstop since buying it earlier this year, way more than I normally used my slow cooker in the past. The sear/saute option changes the whole crock pot game. Dan and I are huge fans of seafood bisque. In fact, if a variation of seafood bisque is on a menu, we almost always order it. Even if it doesn’t “go” with the rest of our meal. It’s just a special sort of dish to us, especially since I rarely take the time to make it at home. That’s one of my rules when ordering out: try to eat as much stuff off the menu that I’m not ambitious enough to try in my own kitchen. It works out well 99% of the time. 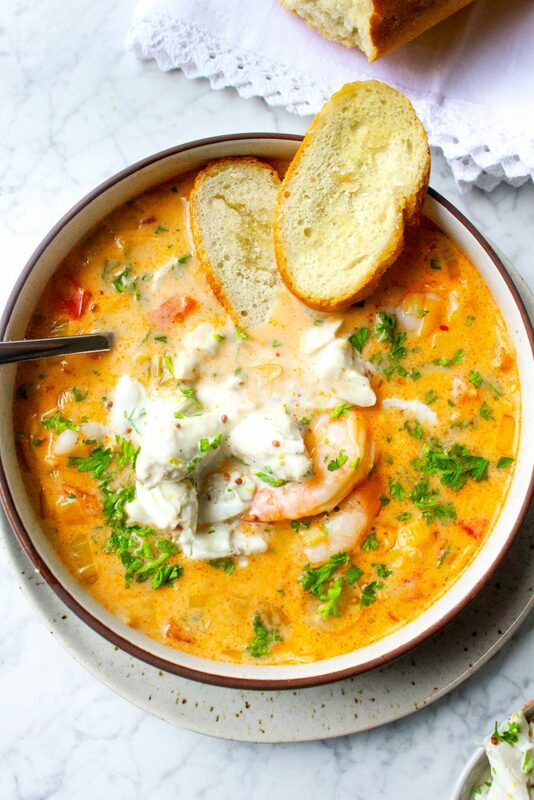 The thing is, seafood bisque, when done right, can take some extra love and labor. It often involves boiling crustacean shells to infuse your stock. Lots of straining and heating and reheating. I usually don’t have time for that. My solution? 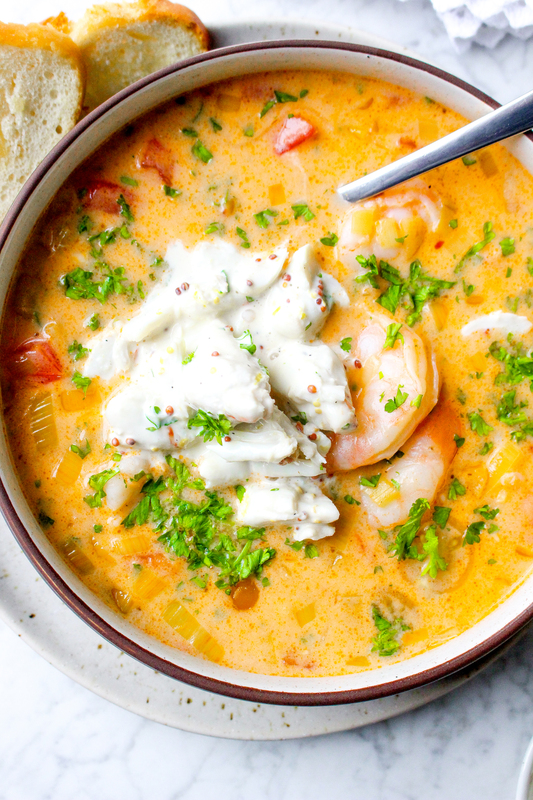 Use really, really good, fresh seafood and store bought seafood stock. Seriously. People will never know the difference, as long as the seafood you’re using is fresh. 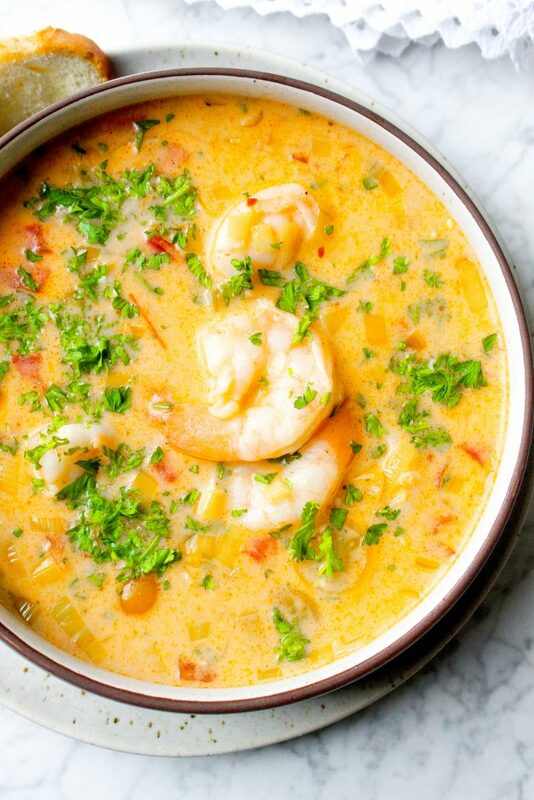 For this particular bisque, I went with shrimp and crab, two of our favorites. 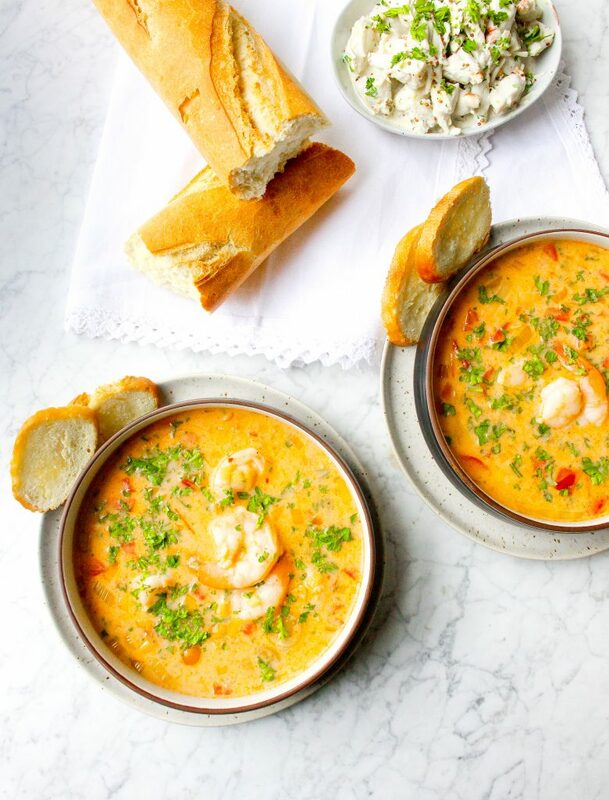 The shrimp are affordable and easy to find, and the crab…well…that’s the indulgent part of this dish. 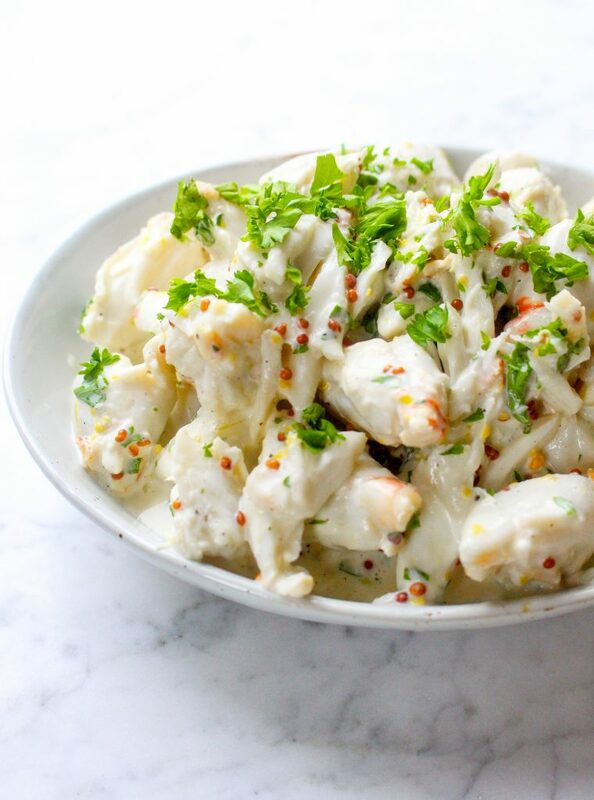 Jumbo lump crab costs a pretty penny, but I find that a little goes a long way. 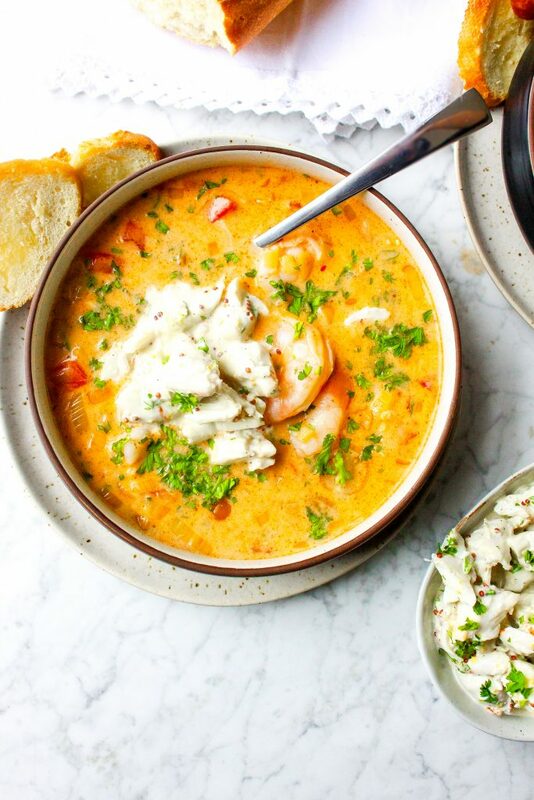 Plus, people just get EXCITED when lump crab shows up in their bisque. And who can blame them? It is a very special ingredient that is definitely worth the price point. It makes this bisque something special, too. The bisque itself is fairly straightforward. Veggies, stock, aromatics simmering away for a few hours (oh, and let’s not forget the sherry. VERY important). 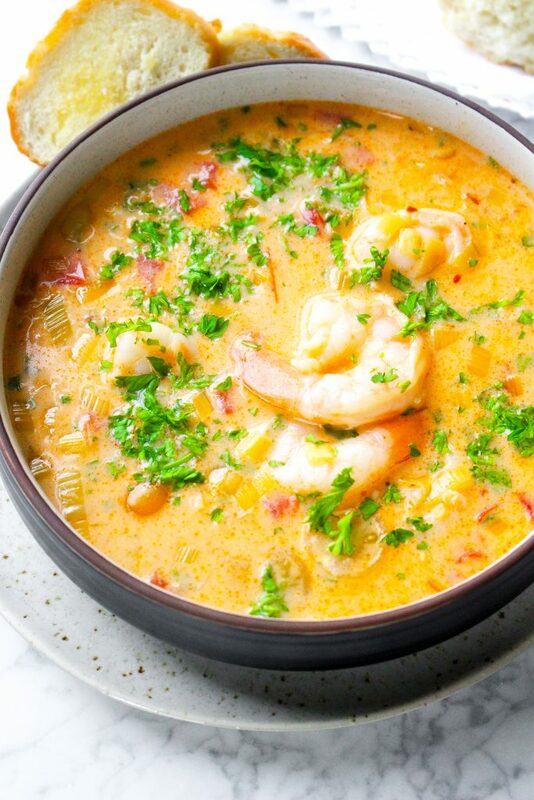 Shrimp and some of the crab are added in and poached until just tender and perfect. Then comes the rest of the crab. In cold salad form! 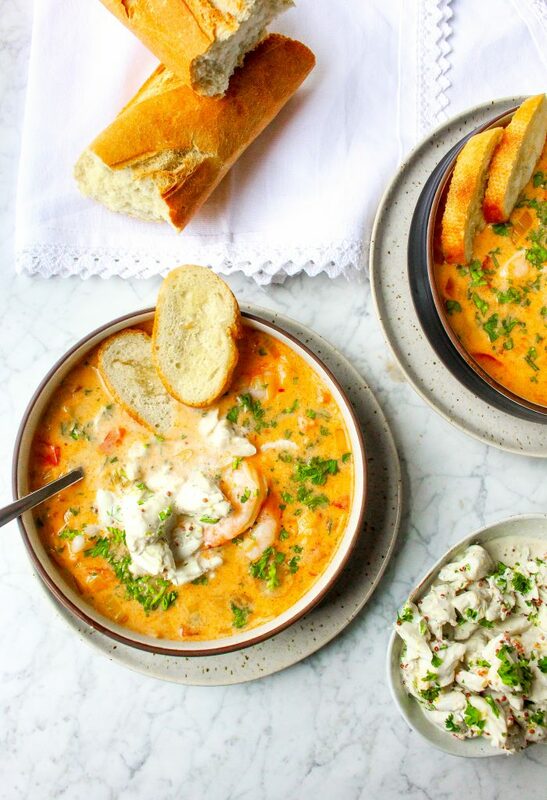 OK, so I know it sounds kind of weird to top a hot, rich, creamy soup with a cold crab salad, but this is one of those weird things that you’re just going to have to trust me on. It works, people. It just does. The crab is lightly (key word!) dressed in a mixture of mayo, mustards, lemon, and herbs and added to each bowl of soup just before serving. It adds a fun and slightly tangy twist to the dish. Plus it’s gorgeous! It adds a slightly different, weird-in-a-good-way twist on a fairly traditional seafood bisque, and now that I’ve gone weird, I don’t know that I can ever go back. In fact, it pairs perfectly with this super weird weather we’re having. Oh, and icy cold white wine and crunchy baguette toasts. Just sayin’. I have a slow cooker that can be used like a skillet, so I made this entire thing in the slow cooker pot. If you have a sear/saute option on your slow cooker, you can save a couple steps (and the second pan!) and do the whole thing in the slow cooker. 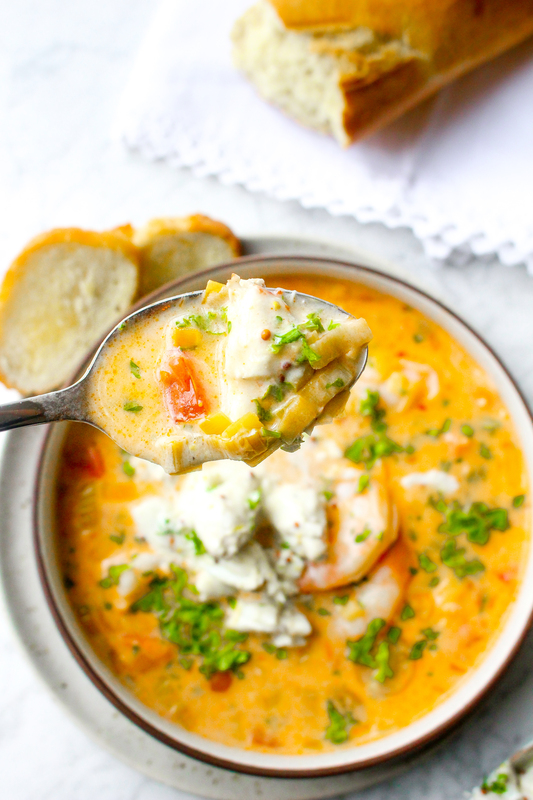 Warm, cold, or mild I’d happily eat this shrimp bisque any day of the year! 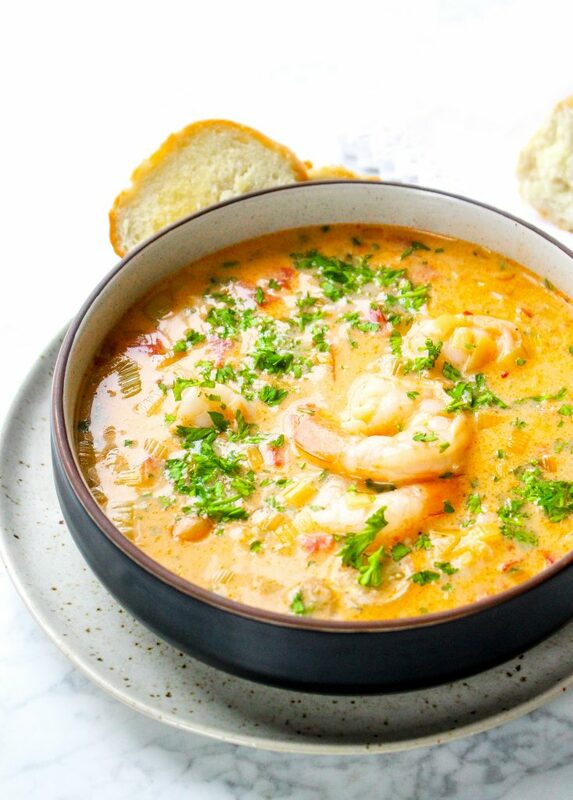 She Crab Soup is a thing where I live (in Charleston, SC) and it’s served year-round so I feel like this one could be too. It looks great. Thanks so much, Aimee! I totally agree. 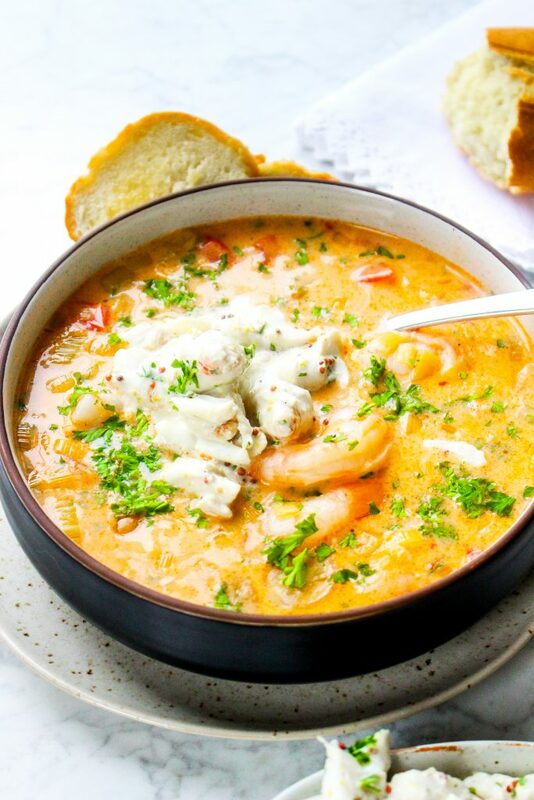 Also, She Crab Soup is something I need to try! I never comment on recipes, but had to tell you that this is AMAZING! My daughter is allergic to dairy, so I used coconut milk instead, and it is still good. In fact, my picky two year old and four year old both loved it. Also you were right about the cold crab salad on top. Perfect. Aww, thanks so much for the comment, Danielle! It means the world to me. I’m so glad you and the kids enjoyed this! I skipped the sauce for the crab topping but made the bisque in my crock pot today. It was delicious! I used an assortment of seafood (cod, salmon, shrimp, etc) and made a fish broth beforehand. My husband absolutely loved this bisque as well. It is a nice, light meal for a cold day! Can’t wait to make it again! Thanks so much for sharing! So glad to hear you enjoyed it! Thanks, Heather! This was really good. 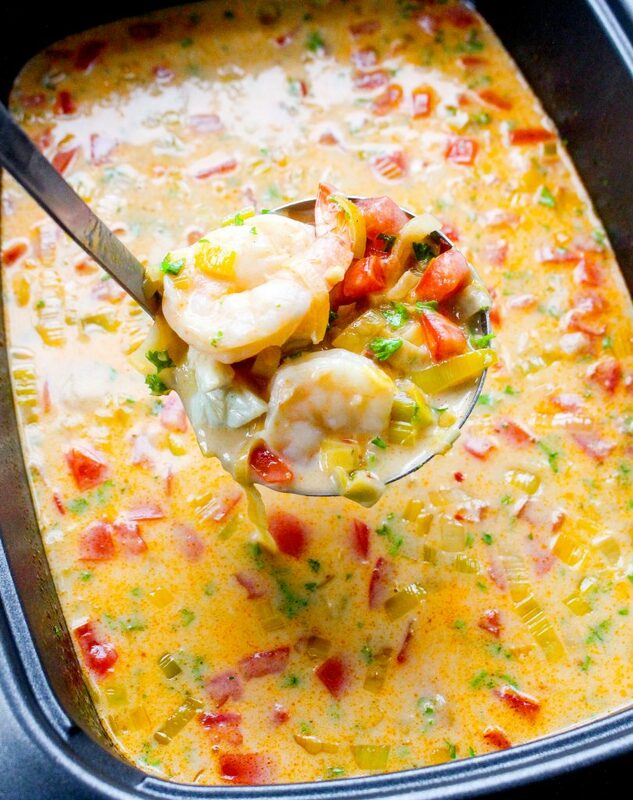 When the broth was done I pureed it with an immersion blender added the shrimp & finished with fat free half & half. I used the leftovers for a sauce for lobster ravioli. It was delicious. I will definitely be making this again. Thanks, Tara! I’m so glad you enjoyed this! Would be even more awesome if you could not make folks dig for the recipe. Nice pics and a great story but really am interested in the recipe. Thanks for the feedback. This is, however, a food blog, not just a recipe database. That’s the way I choose to present the recipes. Hope you enjoy the soup! I made this without the leeks simply because I forgot them at the store. Even still, it was delicious! Thanks for the recipe. So glad to hear this! Thanks, Shayla!